FE racing has seen a growing interest in the larger boats and Q & S Offshore is no exception. The following article is on how I set-up my boat for the upcoming season. 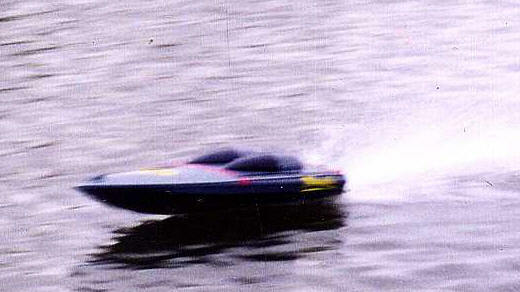 One of the boats in my arsenal that surely gets my heart thumping is my Aeromarine Scorpian. I’ve been testing a motor in with the support of Andrew Gilchrist of fastelectrics.com and think I have a competitive set-up for the upcoming season. 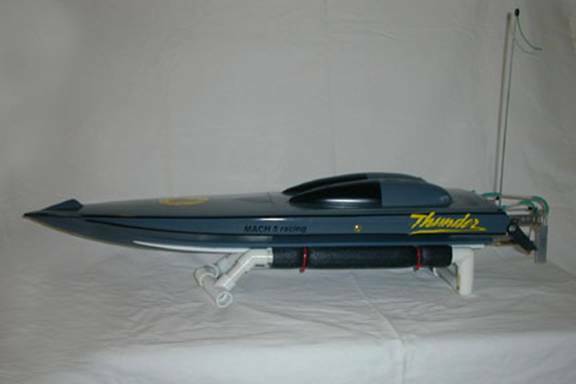 The 32”Aeromarine Scorpian is a first class, high quality fiberglass nitro hull that is light enough for FE use. ( approx. 2lbs w/o hatch) Its streamlined low profile and ability to handle rough water are just some of the reasons for purchasing the hull. I choose not to use the fiberglass cowl in favor of saving a little weight. Instead, I constructed a lid made from sheet styrene with a couple of model airplane WWII fuel tank ½ sections and made a nice twin canopy cover. 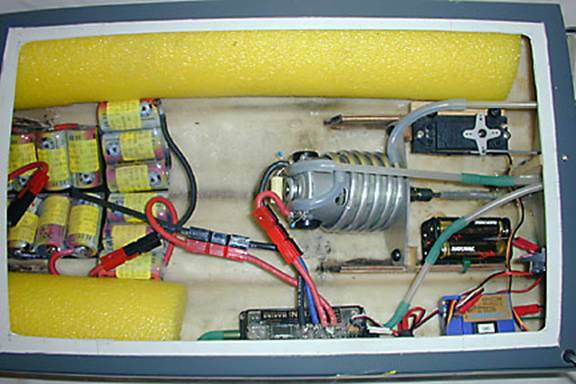 The hull also came with nitro engine stringers that were removed with a dremel in areas not needed, to save weight. After being primed and sanded for proper preparation the hull was painted with hardware store spray enamel. Gunmetal gray was chosen to follow along with the ‘Thunder’ theme of my offshore boats. 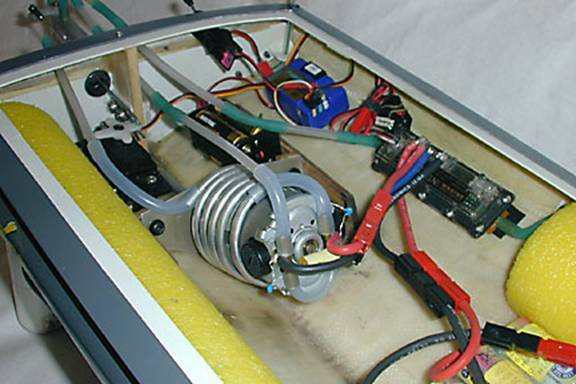 The motor used is the powerful LM800BBX Neo from FASTELECTRICS.com. This motor, another exclusive to Andrew Gilchrist's arsenal of Lightning Man Neo powerplants is rated at 12v. Andrew claims with proper cooling and prop set-up it can handle 18 cells and I’m a believer. The motor has replaceable brushes with unique brush retainer caps that make it easy to inspect or change brushes. 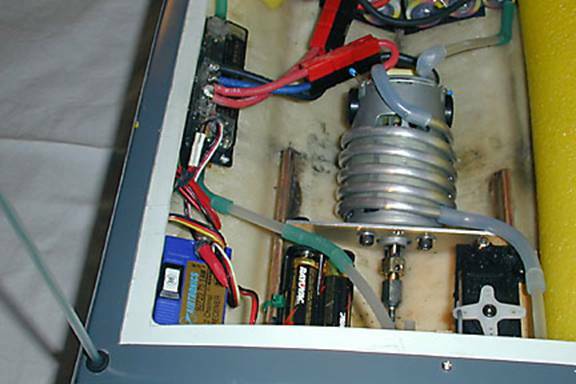 The motor came with brass cooling tubes soldered to the motor contacts for brush cooling and Deans wire for power. A spare set of brushes is supplied with each motor. I fabricated a cooling coil made from 3/16-dia. aluminum tubing to handle unwanted heat. A mount was cut from 1/16 aluminum plate. (Acts as a heat sink) The LM800BBX has (3) mounting holes for positive location with 4mm self tapping sheet metal screws. An Octura 5mm hex flex was machined to 6mm to fit the motor shaft and handle the power transfer. I like to position my mono motors as far aft as possible. This allows the direct drive flex cable to be shortest length possible for less resistance. 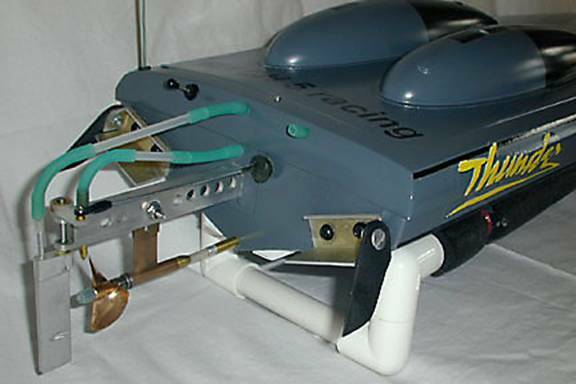 The C/G can be adjusted by moving the nicads fore and aft to balance the boat. Cooling lines scavenging from prop-wash are plumbed to the motor while the rudder pick-up handles the ESC cooling needs. I prefer to mount my rudders on center for Offshore enduro because the boat must turn right and left. The .130 flex cable spins through a Teflon tube shielded in brass tubing that exits at the very bottom of the transom. The prop shaft is set parallel or neutral for maximum efficiency. Dual turn fins and trim tabs were added to generate more stability in the corners. The tabs were fabricated from 1/16 gage aluminum sheet stock and have a ride pad area of 2”wide by 1”deep. 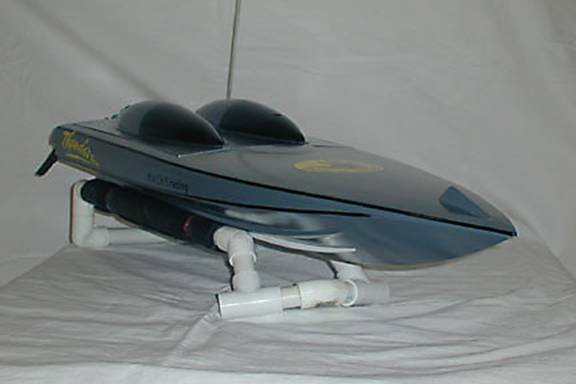 The fins are leftovers from a Graupner hardware kit. I found the x442 prop gives maximum run time at competitive speed for offshore competition while the x645 prop can be used for impressive speeds in mono sprint classes. The electronics were the last thing to be added. A standard servo for rudder control was mounted on the right side hardwood stringer just aft of the motor. The Tekin 432m ESC and Airtronics receiver were mounted on the left side floor rear using Velcro tape. The (18) 2400 nicads as were positioned on center about 3” in front of the motor and secured with Velcro tape. The antenna tube exits out the right rear corner of the deck. Deans 12 ga. wire was used with Sermos style connectors. The Scorpian is a constant head turner at the pond. Combined with the LM800BBX Neo, the Scorpian can be setup for fun or competitive racing. The motor has an excellent power band and really makes the Scorpian fly. Because the hull was designed for nitro applications it has only one set of lifting strakes. In calm water conditions it has a tendency to run slightly wet. I recently added an additional set of strakes. They are centered between the existing ones and the keel; in hope the boat will air out and increase overall performance. I’m convinced more test time with these changes should yield positive results. In closing I’d like to thank Andrew Gilchrist from fastelectrics.com for all his advice. Fastelectrics.com carries high quality LM Neo motors, hulls and FE racing supplies. Also Aeromarine, for creating a great quality contender for fast electric applications. Aeromarine hulls are available from www.finedesignrc.com. Fine Design has a wide selection of hulls, Cordite motors and FE racing supplies. Also my wife Nancy for letting me have the ‘shop time’ to do FE boats.